we saw in the banks. We carry credit cards, but they are often not accepted for the majority goods and services where we travel, which are for the most part second-world countries. Thus, before we depart for a new country, Wayne makes a habit of acquiring some currency for the next country from a local bank. That way if there’s no ATMs available or working – often the case -- and we need cash for check-in, or food or who-knows-what, we’re prepared. We were glad we allowed plenty of time for the exchange before we left American Samoa to acquire some Tongan dollars, called TOP or pa’anga. It took 45 minutes and quite a few of the bank personnel’s involvement before we finally got our US dollars exchanged for TOP. The last portion of the delay occurred because when Wayne looked at the cash, fortunately while the teller was still with us, he noticed some of it said Fiji! 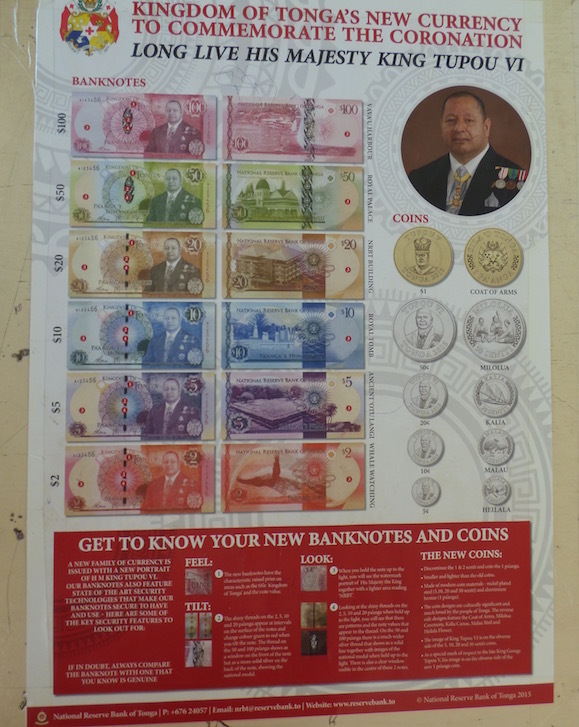 With much additional ado, the Fijian portion was exchanged for TOP. 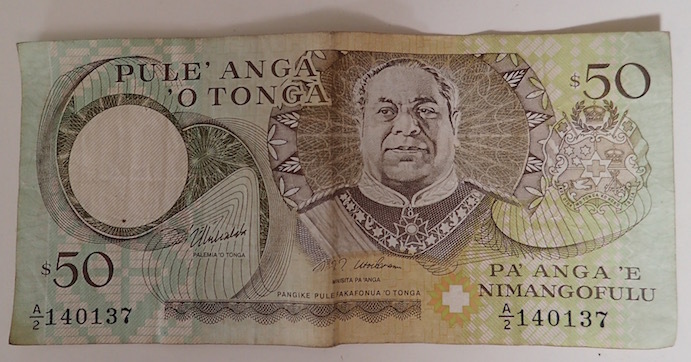 We left with a little less TOP (about $170 USD – most of which we’d pay for our Tonga check-in) than we wanted because the bank didn’t have much TOP, even though Tonga was a neighboring country. bills were replaced by a coin. All other currency remained the same. When we went to the tiny bank in sparsely populated Niuatoputapu, Tonga, our first Tonga stop, Wayne decided to get some additional cash. The bank there had no computers. Their cash simply sat on desktops. All transactions were recorded on paper and locals tracked their transactions in hand-written passbooks. Shortly after arriving in Neiafu, I decided to get my hair cut, making sure I had the 50 TOP cash (a little less than $25 USD at current exchange rates) on me we’d acquired just a few days prior in Niuatoputapu, Tonga. “Oh! You do know these 50 TOP bills will be no good at the end of this month, right?” asked Fatima, the hairdresser. The tellers in Nieafu were surprised when they heard we got the about-to-be-discontinued bills so recently from Niuatoputapu and astonished at our description of the Niuatoputapu bank (cash on the desks, no computers. Then again, we were glad there were 2 banks with ATMs in town in Nieafu as one of them was out of order for days…. The $1 bills are also now replaced with $1 coins. A local tradition for dancers is to oil up, fo fans to "paste" cash tips on them. "It'll be interesting seeing if the $1 coins stick to 'em," mused a cruiser. This post was written and pre-posted in Nieafu Tonga ( S18.39.649 W173.58.956). When it posts, we hope to be exploring Tonga Vava'au's outer islands.